We were so busy over the weekend, I more or less forgot about the New Frontier DVD contest. My amnesia is your opportunity. 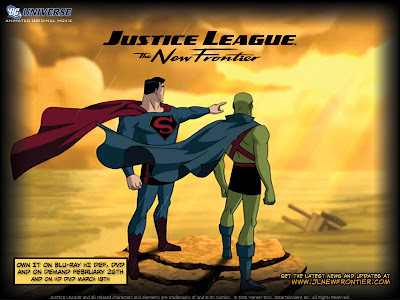 If you'd like to submit an entry to the DVD give away for "Justice League: New Frontier", try to submit an entry before 7:00PM CST, March 10th. I'll be coming up with my random drawing technique this evening and making an announcement ASAP. In order to submit and entry, contact me via e-mail or comments section. If you want to double your chances, let me know the identity of your favorite Justice Leaguer, along with a sentence or two as to why. My favorite Justice Leaguer is Booster Gold (does he count?). I like him because, if I had the power to travel back in time, I would use it to profit - and certainly not fight evil. Plus, he's got a robot sidekick. And time travel is cool.